After his parents die in an auto accident, brilliant electronics student Ethan Lightman (Thomas Mann) puts college on hold to become the adult caregiver to younger siblings Matt (Percy Hynes White) and Becca (Kate Moyer). While making sure the day-to-day drudgery of everyday life like doing homework and taking out the trash is accomplished , Ethan still feels compelled to continue research into a machine he hopes will revolutionize how people power their homes. But instead of working as designed, turns out his invention is far more powerful in a way he could never have anticipated. Somehow, this device has paranormal abilities, and soon the spirits of the trio’s dead parents are apparently attempting to interact with them from beyond the grave. 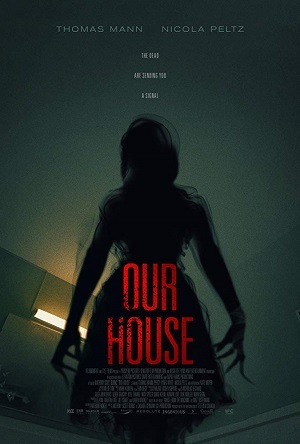 Based on the 2010 film Ghost from the Machine, writer Nathan Parker (Moon) and director Anthony Scott Burns’ Our House is a slick reinvention of filmmaker Matt Osterman’s indie shocker that makes up in visceral intensity and emotional nuance what it lacks in originality. It’s a fast-paced, character-driven thriller that, while not nearly as scary as it could have been, managed to grab hold of my attention fairly easily. I was intrigued as to how Ethan and his siblings were going to solve this supernatural mystery, and while the answers weren’t surprising they were still just good enough to keep me pleasantly satisfied for the majority of the film’s brief 91-minute running time. I honestly liked how mundane much of the first half of the film is. Ethan is forced to become an adult far sooner than he thought he was going to have to, putting his own dreams on hold in order to take care of his brother and sister. In turn, Matt and Becca aren’t always sure how to relate to him. Is he still their brother? 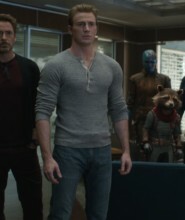 Is he their new parental guardian? All three are forced to figure things out as they go along, hitting a variety of roadblocks along the way as they also attempt to process their grief. 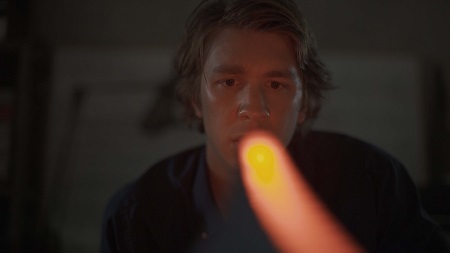 All of this gives the film a heartfelt human element that I found crushingly effective, this emphasis on the relationship between all of the Lightman kids allowing the more suspenseful aspects of the story to have an extra unsettling kick they otherwise wouldn’t have had. What doesn’t work is the film’s final 15 minutes. It’s not exactly a shock to discover the spirits conjured up by Ethan’s machine aren’t all benevolent. 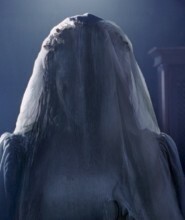 It’s equally obvious that the at least a few of the ghosts whispering silently to Matt and particularly to Becca might not always have their best interests at heart. When things go crazy the answer to the supernatural riddle vexing the Lightman clan is pretty easy to solve, even with odd Insidious meets The Girl with the Dragon Tattoo twists concerning their home’s troubled history which happens to include an unsolved mystery involving a missing girl and some rather convenient extra square footage in the basement that wasn’t in the original building plans. It’s standard stuff, and Burns has trouble doing much that’s all that unique or unexpected with any of it, and as such tension and suspense are diluted quite significantly. Even with this being the case, I enjoyed Our House. As I’ve already stated, I couldn’t help but respond to the film’s emphasis on the emotional interactions of the three siblings. There is a realistic, lived-in complexity to their dynamic that augments the inherent drama of their situation, and because of this I genuinely cared whether or not they were going to survive. Burns, working as his own cinematographer, shoots things with a naturalistic simplicity that’s striking, the use of natural light adding a layer of mystery that likely wouldn’t have existed otherwise. As far as performances go, Mann is in full Me and Earl and the Dying Girl mode with a dash of the flippant uncertainty of his Kong: Skull Island helicopter pilot thrown in for good measure. Some will find that combination of character traits to sound intriguing while others will likely want to run screaming in the opposite direction of whichever theatre this film happens to be showing in. As I liked Mann’s performances in both those efforts I thought he was just fine here as well, and even if the actor isn’t noticeably challenging himself I still think he anchors the major dramatic moments with a determined confidence that felt unforced and natural. White and Mayer are also good, the former in particular, while Robert B. Kennedy is suitably unnerving as the Lightman’s next door neighbor who has suffered his own recent tragedy, a misfortune that while will revisit him thanks to Ethan’s little invention. I can’t help but wish that Parker and Burns had spent as much time on the paranormal aspects of this tale as they did the familial ones, and as strong as the latter aspects might be the unexceptional routine inevitability of what is going to happen to the Lightmans does get frustrating at a certain point. The lack of tension, no matter how technically proficient the film on the whole might prove to be, is a major stumbling block, as is the throwaway role as Ethan’s questioning girlfriend rising star Nicola Pelz is tasked with portraying, all of which makes it hard for me to recommend this one, even to genre fanatics, with anything close to enthusiasm. But I still enjoyed Our House, all of those various issues notwithstanding. It has heart. It has notable style. It puts its characters first and worries more about their development than it does the central complexities and machinations of its ghost-spawning sci-fi MacGuffin. Burns showcases raw, imaginative talent behind the camera and Parker, much like he did with Moon, composes characters for a relatively benign and intellectually unthreatening genre programmer and makes them more emotionally complex than initially meets the eye. Even with all its faults I still liked this movie just enough that I’d happily watch it again, the Lightman family’s paranormal exploits just interesting enough to make going to a matinee screening or renting it via VOD moderately worthwhile.